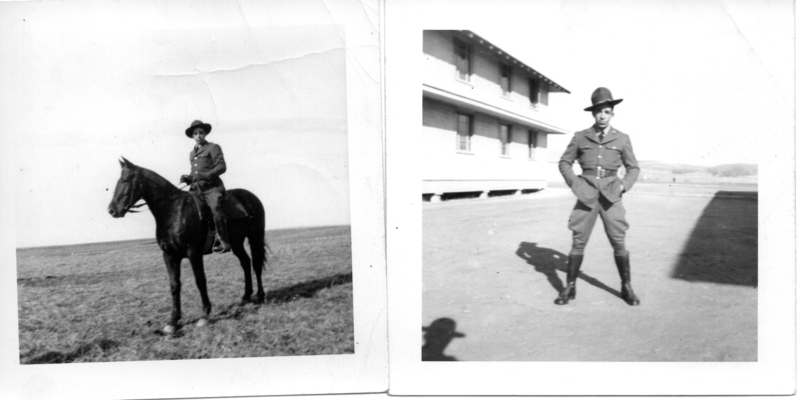 Walt’s cousin Elizabeth found some photos among her mother’s possessions after her death in 1999 and sent them on to Ruth. Her mother was the Aunt Ruth Walt lived with when he was in Ohio. 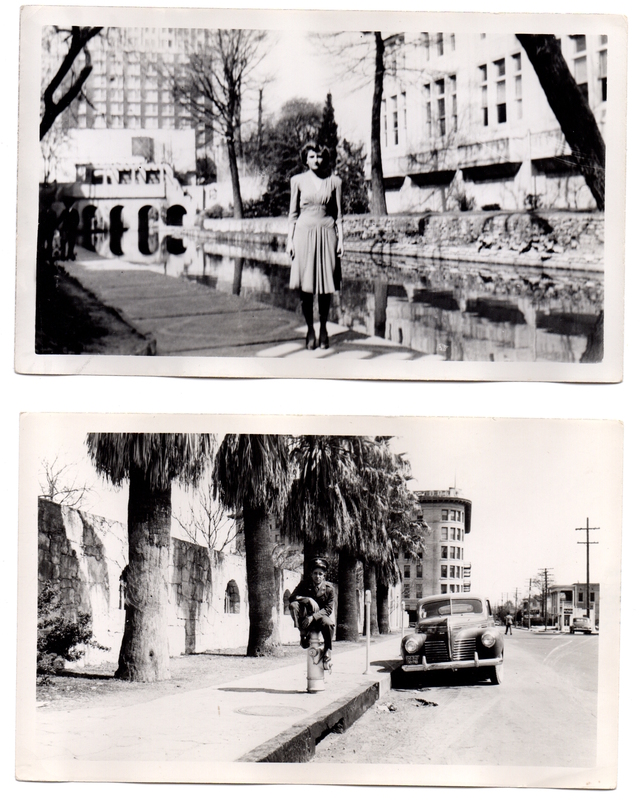 The photos show Walt and Ruth in other wedding day poses in San Antonio. It appears that Ruth did stay with Walt in Texas, and then followed him to Oklahoma for more training. That’s as far as the diary goes. Sent to San Antonio Texas on 16th Nov—arrived 17 Nov. for Air Cadets. Nov. 20th. Had some drill today. —Perplexed as to how Ruth and I are going to get married. N. 21. to Dec. 10—Passed tests, etc.—expecting to go to preflight soon. Am really perplexed now about Marriage. Looks impossible at the present time. I feel sorry for Ruth, I’m always sorry for myself. I hope it turns out O.K. She is my Honey. Dec 17—I’m supposed to get a 3 day pass over Xmas. telegraphed Ruth to come. I’m still trusting everything turns out O.K. Dec. 22. Ruth should be in San Antone today, maybe tommorrow. Hip, Hip—Hooray—She’s my Honey. Dec. 24. Had some trouble getting pass but finally got it signed. Met Ruth—she is beautiful—We were married at 3:00 today—I am one lucky guy. Everything is going to turn out O.K. I’m sure. 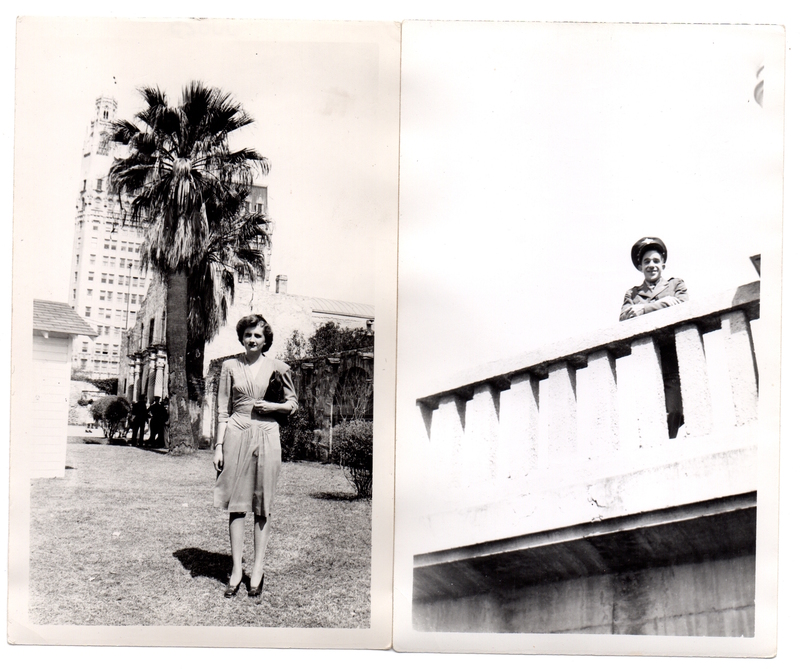 Dec. 25, 26 [illegible cross out]—A very short Honeymoon. I am glad I got some time off. I think Ruth will more then fulfill all expectations. Dec. 27.—Cold this morning—I hated to leave Ruth. She came to visited me this afternoon—She was almost froze. Dec. 28. [can’t make out first one or two words] floor this morning—Ruth is going to look for work this afternoon—Hope she can stay. I’ll be glad to have her near me. Dec. 29—Ruth came to the Post tonight—A shame I get to town. I’m more then glad she can come out tho. Dec. 30—Ruth came out again—She is sweet. Guess she is having quite a vacation—Hope she is happy—She sure is a good sport. I love her. Jan 3—Sun—Ruth out all day—A walk in the Cactus—Ha.—Very windy. Jan. 4. Dear Diary—this is important I believe.—I don’t know how I should feel—but I feel good—If you don’t know what I mean you’ll have to guess—wow! Jan 5—Ruth visited me—gas chamber today. Jan. 16—Jan Mar. 18. Went thru Preflight O.K.—Saw Ruth almost every nite had 4 Open Posts 2 passes.—tough but not too tough. Mar. 20—Left at 1:45 for Okla. City. Mar 21. Arrived at Cimarron Field for Primary—Have contacted Ruth—So far every thing is O.K.—but I damn sure don’t like it. A fairly good picture with summer shirt we use it for dress—The tie is Cavalry style—We have to wear it this way when we are without blouse. buttons should be buttoned—Ha. I also added a few photos that were pertinent to the letter of 21 January 1942 on that page. I never thought much about these little heads, past having looked in the box and then put it away in my china cupboard, but on taking another look, I wondered how you could display them, since they don’t stand on their own. Then I turned them over and realized they are cups for sake, at least that’s what the Internet says. Maybe they will be mentioned in a letter.